Our company has achieved widespread recognition for offering Rice Packaging Bag to the clients. This product is made using better quality raw material and sophisticated technology under the guidance of skilled professionals. Rice Packaging Bag is commonly used to pack rice grains. Offered range is available in various specifications. Vikat Creations commenced its business operations in the year 2015 as the most dedicated manufacturer firm of Shopping Bags. 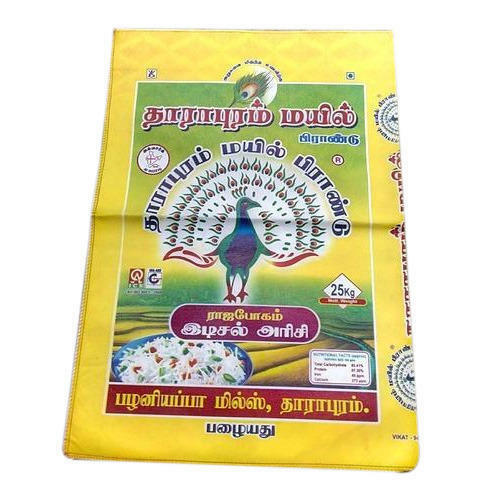 We have become a trademark of widened product range including Marriage Gift Bag, Designer Bag and Non-Woven Thamboolam Bag. We fabricate our extensive product range from fresh raw material from our reliable vendors. We have developed state-of-the-art infrastructure system for fabricating our wide range of products with maximum perfection and strength. Our products are quality assured, safe and reliable, unmatched variety, highly durable and Eco-friendly. Our organization is becoming fast growing bags manufacturing company and we are trying to expand our market rapidly so that we can employ more unemployed skilled and unskilled people here. We follow compact manufacturing process to reduce the manufacturing cost and due to this we are able to provide our products cheaper than any other company. With use of skilled designers, we design these products in various stipulations as per latest industrial standards for serving diverse needs of clients. This indeed gained us the privilege to cater the challenging demands of our esteemed clients.